Shimano PD-M520 pedals are some of the cheapest SPD pedals you can buy. Costing a little more than $30, their pros far outweigh their cons. And the latter are more inconveniences, really, especially when you consider the price. 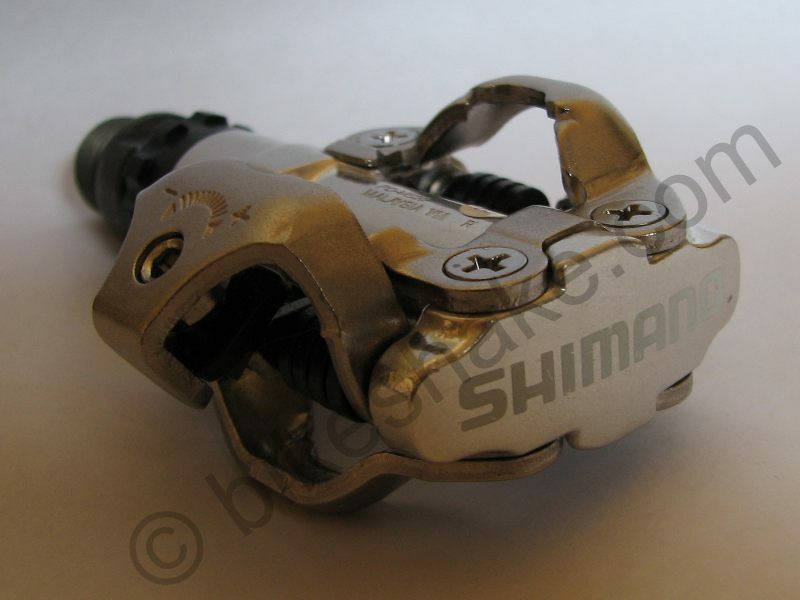 Why are the Shimano M520 pedals the perfect choice for those new to clipless pedals? Because they’re cheap and reliable. When trying something new, people want a quality product for a minimal price. In the case of the Shimano PD-M520 SPD pedals, that’s exactly what you’ll get. The only inconvenience I could find is that you need a special tool, the Shimano TL-PD40, if you plan on servicing the pedals yourself. The difference between the Shimano M520 and the Shimano M540 isn’t really obvious, beyond the slight weight difference and the plastic vs metal construction. As you can see in the photo, the M520 pedals weigh 372 grams per pair, only ~25 g more than the M540. 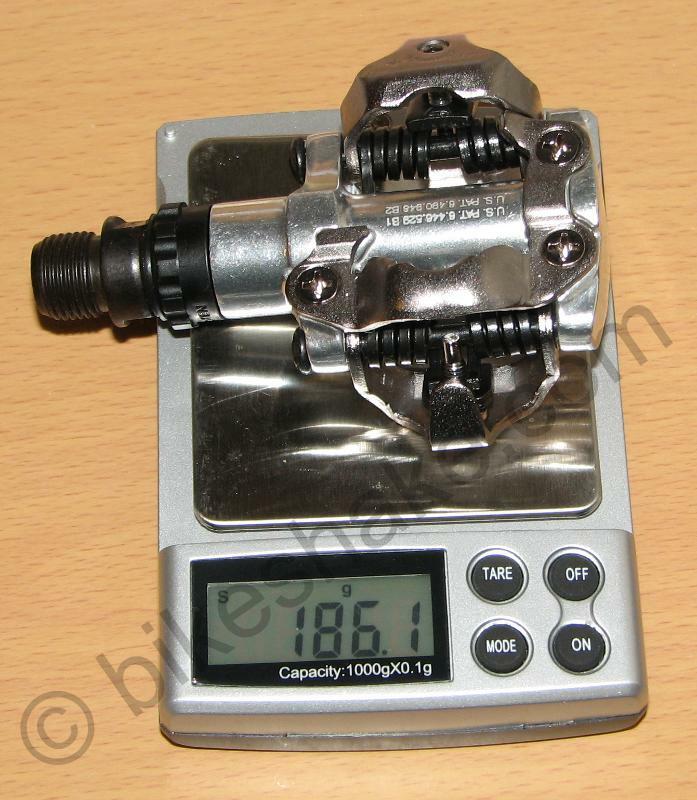 Note that the older (2004) version of the PD-M520 pedals weighed more than 400 g.
I suspect that Shimano uses more durable parts in the more expensive pedal. That doesn’t keep the M520 from working flawlessly for thousands of miles before it needs servicing. Not bad for the price paid, is it? If you feel there’s something wrong with the pedal in the first few rides, the warranty should cover any defects. There are two 3 mm Allen bolts on each pedal. These are used to adjust the tension. Increase the tension to prevent accidental release; decrease it to make it easier to unclip. You might like the default setting, or experiment until you find the most comfortable setting for you. Remember to adjust the bolts on both sides of each pedal. There is a slot for a 6mm Allen key on the crank arm end of the Shimano PD-M520, and you can use the Allen key to start the installation. But the pedals should be tightened using a 15 mm pedal wrench, as the 6mm key can’t provide the necessary tightening torque (according to Shimano). The Shimano M520 pedals can and should be serviced (cleaned, greased) either as a preventative measure, or when you feel something is wrong with the pedals (noise, play, etc.). A yearly overhaul should suffice for the majority of cyclists. But you might have to do it more or less often, depending on your riding conditions. You can easily do that yourself with the right tools, or you can have your favorite mechanic do that for you. To take apart the M520 pedals, a special tool, the Shimano TL-PD40, must be used. If you’re going to overhaul the pedals yourself, don’t try removing the pedal axle with anything else (any kind of pliers, etc. ), as you’ll just damage the plastic sleeve of the pedal. Shimano PD-M540 servicing doesn’t require you to have this tool, as it’s an all-metal construction, although they’re more expensive than the M520 pedals. A 15 mm spanner to remove the pedals. A vice to hold the axle while you adjust the bearings. It can be done without it, though it won’t be as easy. A 10mm and a 7mm wrench to adjust the bearings. Get Shimano PD-M520 pedals from Amazon, CRC or Wiggle.